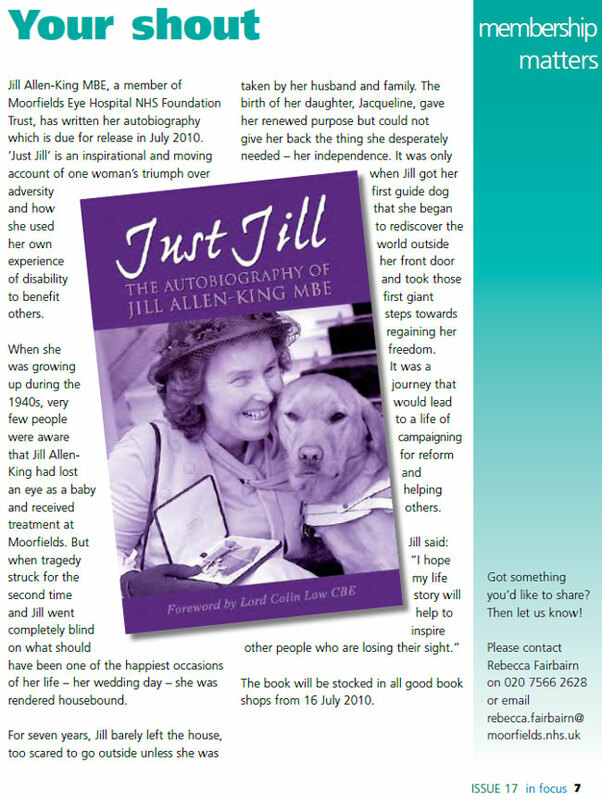 Brief Description: Just Jill is an inspirational and moving account of one woman’s triumph over adversity and how she used her own experience of disability to benefit others. When she was growing up during the 1940s very few people were aware that Jill Allen-King had lost one eye as the result of measles when she was a baby. Her disability was a taboo subject and she attended a normal school, progressed to catering college and secured employment as a cook. However, tragedy struck for the second time when glaucoma rendered her completely blind at the age of 24 on what should have been one of the happiest occasions of her life – her wedding day. For the next seven years Jill barely left the house, too scared to go outside unaccompanied and afraid that she would never again be able to participate in the activities she loved, such as dancing. The birth of her daughter, Jacqueline, gave her renewed purpose but could not give her back the thing she desperately needed – her independence. It was only when Jill got her first guide dog that she began to rediscover the world outside her front door and take those first giant steps towards regaining her confidence and freedom. 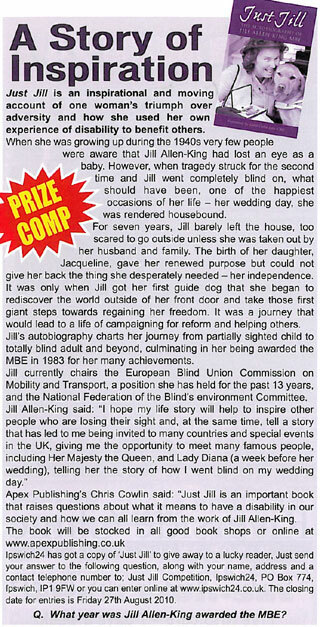 Jill’s autobiography charts her journey from partially sighted child to totally blind adult and beyond, a process of readjusting and learning through grit and determination and then using her knowledge and experience to do everything in her power to help others and to campaign for reforms to secure a safer, fairer and more disability-aware environment. It is a story that will provide encouragement to those that are struggling to cope with disabilities and also educate people from all spheres of life about the challenges and needs of disabled people. At the age of 70, Jill continues to fight for the cause, and hopefully her story will inspire others to take up the baton. Special Note: This book is also available as an eBook. The hardback edition of this book is out of print. About the Author: Jill Allen-King was born in Southend in 1940, while the Second World War was raging. In spite of being partially sighted, she was able to enjoy a fairly normal childhood and, on achieving a catering qualification, worked as a cook. On losing her sight completely at the age of 24 she embarked on a journey of self-rehabilitation, gradual readjustment and learning, until she finally regained her confidence and independence. She has never allowed the fact that she has lost her sight to hold her back, and she dedicated the rest of her life to voluntary work, campaigning tirelessly to improve facilities for blind and disabled people. 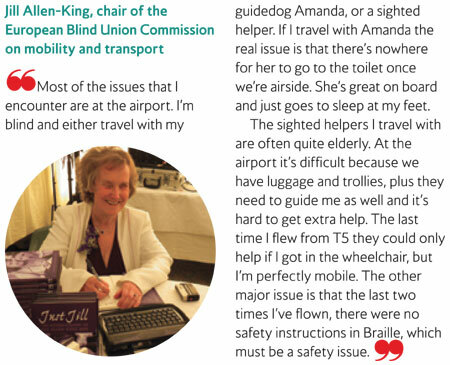 Jill currently chairs the European Blind Union Commission on Mobility and Transport, a position she has held for the past 13 years, and the National Federation of the Blind's Environment Committee. She was awarded the MBE in 1983 and the OBE in 2011. 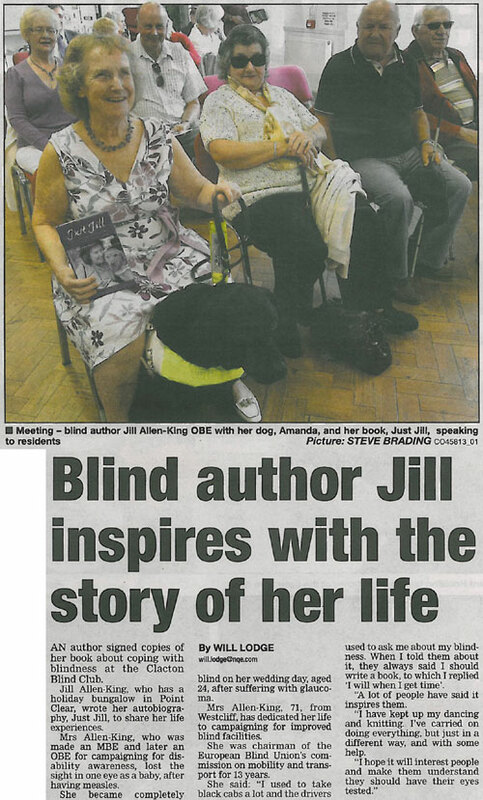 Jill lives in Essex with her second husband, Alvin, who is also blind, and her sixth guide dog, Amanda. She has one daughter, Jacqueline and two grandchildren, Joseph and Emily. 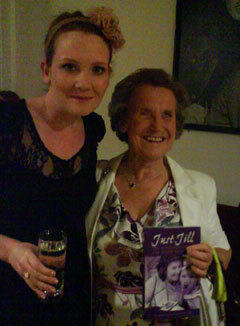 (Picture: Jill Allen-King MBE and Jennie McAlpine holding a copy of 'Just Jill'). 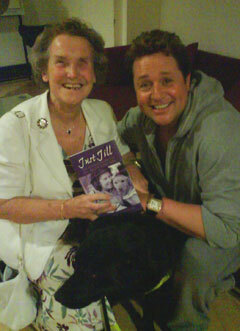 (Picture: Jill Allen-King MBE and Michael Ball holding a copy of 'Just Jill'). (Picture: Jill Allen-King MBE and Christopher Biggins holding a copy of 'Just Jill'). Jill gives a moving and honest account of her journey through sight loss. The joy that her guide dogs have given to her and the freedom and independence that they have made possible for her shine out. At Guide Dogs we know the difference that a guide dog can make to an individual's life. Through this book, Jill will be able to share that with many other people who like her would benefit from the mobility and companionship that a guide dog brings. For those who know Jill personally she has long been an inspiration. Through this book I am sure she will inspire many others who are affected by sight loss to live the life that they want to. This redoubtable fighter for equality and opportunity has demonstrated in her own life just what can be achieved and how personal testament contributes to wider campaigning success. This is a remarkable book by a remarkable person who has had a remarkable life. Jill Allen-King's life has certainly not been short on incident or drama. She had to have one eye removed on account of measles on her first birthday. When she was 13, her aunt and uncle were drowned in the Canvey Island floods of 1953 and Jill was drafted in to help with the clean-up. Having been told to conceal her visual impairment, school was a struggle for want of the appropriate support. Nevertheless Jill acquitted herself well and went on to college to study catering, whence she ended up cooking for Shell and the directors of Gallagher's, the cigarette manufacturers, in the City of London. She was active in the Girls Life Brigade, and also a keen dancer. Then, when she was 24, all this came to an abrupt halt when her sight went completely on, of all days, her wedding day. Health and Social Services failed her badly, providing nothing in the way of information or support. What little advice they did give was plain wrong, such as that her eye condition made it necessary for her to be sterilised after the birth of her daughter so that she had no more children. This was just medical prejudice that a blind person could not or should not bring up children. As a result, Jill found herself on her own, newly married and shortly with a young child but little in the way of help, unable to go out by herself and believing that the active life she had previously enjoyed was at an end. But Jill had too much spirit to remain in this condition for long. Gradually, over the first few years, she resumed her knitting, her dancing and her dress-making. She was asked to take charge of a Girls Life Brigade company again. She received mobility training and acquired her first guide dog. Through meeting other blind people she began to learn what blind people can do. She gained the confidence to put it into practice for herself and spread the word to others. Reporters, then radio and television, began to take an interest, and the rest, as they say, is history. Over the years she has made literally hundreds of broadcasts, given hundreds of talks to schools and church groups, etc., and raised thousands of pounds for charity. Above all she has been a leading member of the movement of the blind to defend the interests of blind people and secure their rights at local, national and international level. She has been particularly associated with campaigns for access to transport and the built environment, to make our streets and pavements safe for pedestrians to walk in and to have household goods manufactured according to design for all principles so that everyone can use them. But she hasn't just confined herself to the concerns of the blind and disabled. She is active within the Liberal Democrat Party and has twice stood for the Council, narrowly missing being elected. What is the secret of her success? She is tenacious and determined. As this book demonstrates, she is a veritable human dynamo and completely indefatigable. She has a very good memory, great skill in mobilising and deploying arguments and a graphic way of putting things that is easy for people to grasp and difficult to forget. As she says, people don't readily forget her. She can engage the attention of the Queen and Princess Diana for minutes at a stretch. She is on familiar terms with ministers, and when she shakes them by the hand, she does not let go until she has finished with them. And the little band of helpers she has organised testifies to the loyalty she inspires. This is a story which deserves to be read. It will serve as an inspiration to the many thousands of people each year who find themselves suddenly without sight and at a loss what to do, and an education to the many millions of sighted people who lack a proper appreciation of what the blind can do. It contains by the way many useful tips on how to manage as a blind person, and could serve as a little bible for campaigners who would follow in her footsteps. But the good news for everyone is, Jill is still only 70 and is still going strong. Jill had been compiling her gripping autobiography the years I have known her. In quiet moments, I have been privileged to learn of many of the unimaginable difficulties she describes in Just Jill, her gripping account of a life conquering and using adversity. Her finished account now brings these cameos together in an astonishing account, which both is entertaining and salutary. During the writing of the book, Jill was also undertaking her many community duties with gusto. One of them, which she only touches on in her book, with self effacing modesty, is being an active and long standing member of the Disability Appeals Tribunal. Imagine that you receive, each month, several bundles of around 600 very detailed appeal papers concerning claimants with a wide variety of disabilities. Then you have to assess them, travel to the local venue in London and Essex and take an active part in enquiring into up to 10 cases per session in open hearings delivering life affecting decisions, often involving quite detailed questions of law. Now imagine you are blind! Jill has to engage a reliable reader to relay every detailed page, has Braille notes (no easy accomplishment) and in each case needs to retain an accurate grasp of each case. Often she has to conduct necessarily intrusive questioning in order to do full justice. All this Jill has accomplished for 18 years with a smile, consummate insight and characteristic warmth. Her quiet and skilled contribution to the English justice system has been astonishing. Like Just Jill, simply unique and impressive. but without a doubt Jill Allen was one of the most remarkable. What was so refreshing about Jill’s advice was its simplicity and practicality Many listeners told us that they were worried about scalding themselves when making themselves a cup of tea. How could they avoid overfilling the cup.? Jill’s advice “start by filling your cup with water and then empty the cup into the kettle.When you have boiled that water you can be sure that you cannot over fill the cup. Jill had equally simple solutions to mobility problems. How did she remember where she was when she had to cross several roads on a particular route. Jill said that she never tried to remember , she simply started by putting into one of her pockets a button for every road she needed to cross. Then as she crossed the road she transferred one button to another pocket. Once all the buttons had been transferred she knew her journey was complete and even if she stopped on the way to chat to a friend she just needed to put her hand in her pocket to check the number of buttons remaining to know how far along the way she had walked. As Jill grew in confidence she got involved with the National Federation of the Blind, and became their spokesperson on many issues . Most famously she initiated the “Give us back our pavements” campaign . This was designed to stop people parking on the pavements and encouraging garden owners to cut back overhanging trees and bushes so that any blind pedestrian could not get an uncomfortable or sometimes painful slap in the face. Jill also came into our studio to interrogate ministers or other leading politicians or those responsible for running charities that provided services for the blind. She was never overawed by distinguished people and her forthright method of questioning often succeeded when more deferential interviewees would have failed. Jill had so many talents as a mother and homemaker, more than many people with good sight.I have never managed to wield a needle to do more than fasten a button,so the fact that Jill could and did design carnival costumes for her daughter left me speechless with admiration. Jill is a wonderful example of someone who has not allowed problems to deflect her from her chosen path. She is a role model for all of us whether we have a disability or just get depressed by the problems that we all inevitably encounter in our lives. Reading her story should inspire us all. 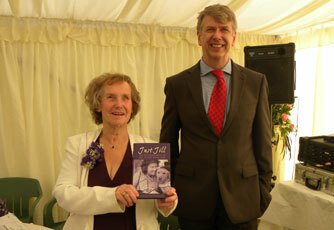 Just Jill: An Autobiography is a remarkable story from a remarkable woman. There can be few people for whom the old cliché of “triumph over adversity” is more appropriate than Jill Allen-King. Her fascinating story provides a powerful social commentary on attitudes towards blind people both from the medical profession and the public at large over the past 70 years as well as an intensely personal account of confronting the challenges of day to day life without sight. To say that Jill has risen to those challenges would be an understatement. Building on her own experiences and frustrations she has become a powerful and persistent advocate for blind people – and others with disabilities - across a wide range of issues from benefit entitlements to transport. I have known and worked with Jill in the transport field for the past 30 years and from our first meeting it was clear that Jill was a force to be reckoned with! The strength of her campaigning came from her personal experience and it was that which caught and held the attention of Government ministers, rail company chairmen and many others. 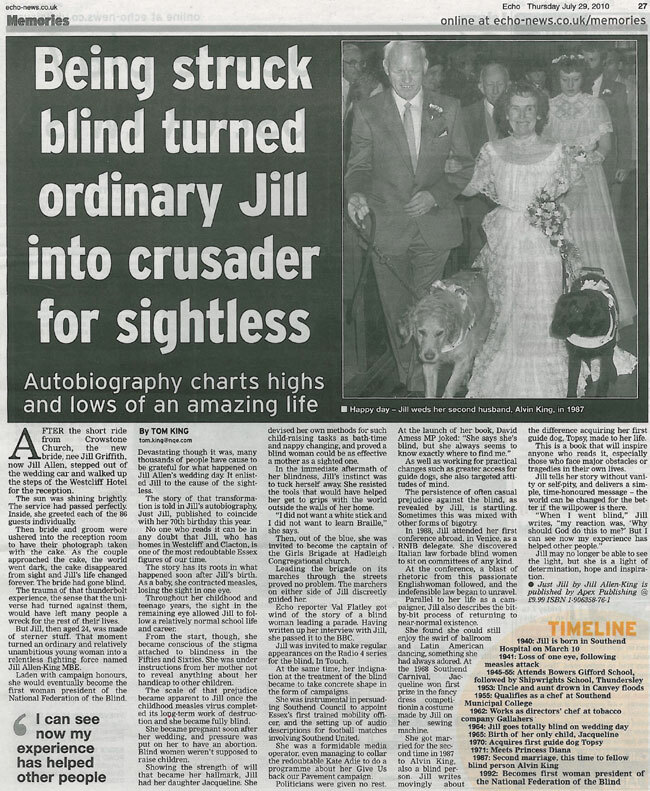 Jill’s book is a powerful and fascinating account of a life lived for the benefit of others – family, friends and the many thousands of blind people and others whose lives have been made easier because of her work. 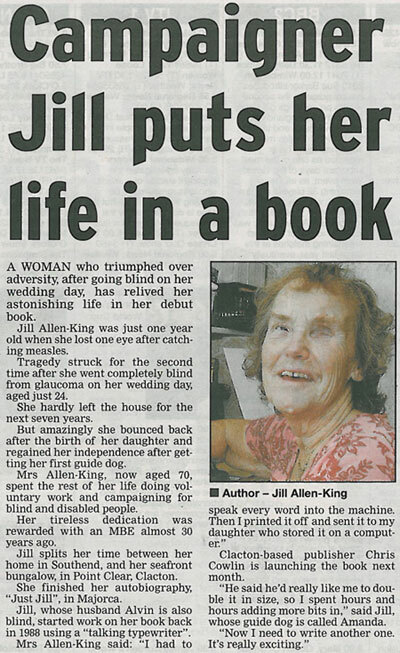 A WESTCLIFF woman who went blind on her wedding day has written her autobiography. 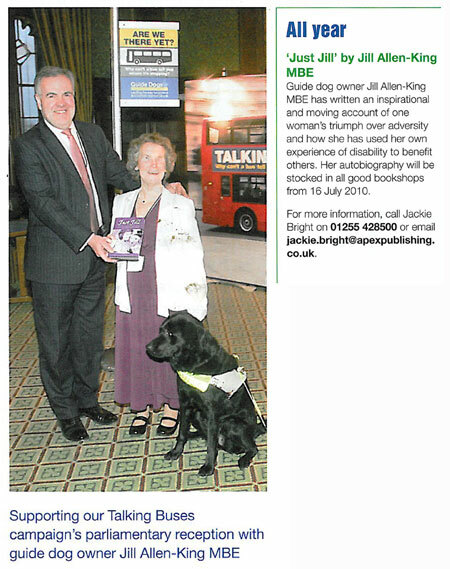 Jill Allen-King MBE, 70, has penned Just Jill, a moving account of her triumph over adversity and how she used her own experience of disability to benefit others. The book recalls how growing up during the 1940s, very few people were aware that she had lost an eye as a baby when she went completely blind on, what should have been, one of the happiest occasions of her life - her wedding day. Jill said: “I didn’t leave the house for seven years because I was too scared to go outside unless I was taken by my husband and family. It was only when Jill got her first guide dog that she began to rediscover the world outside of her front door and take those first giant steps towards regaining her freedom. It was a journey that would lead to a life of campaigning for reform and helping others. 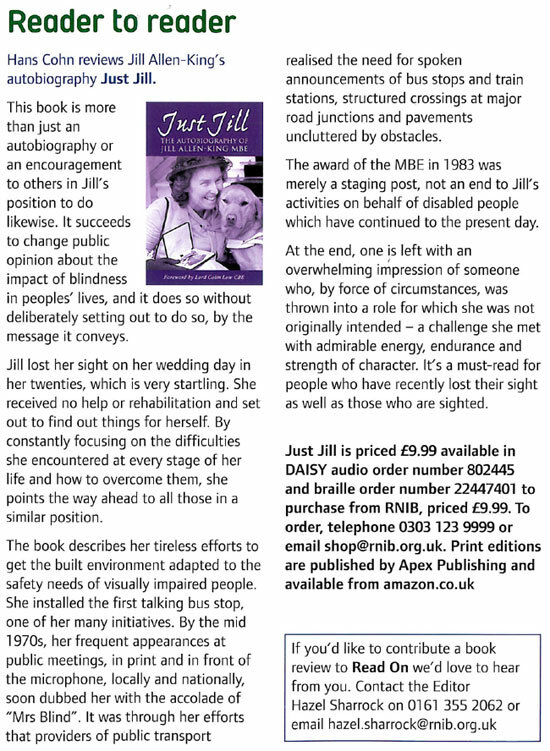 Jill’s autobiography charts her journey from partially sighted child to totally blind adult and beyond, culminating in her being awarded the MBE in 1983 for her many achievements. Jill currently chairs the European Blind Union Commission on Mobility and Transport - a position she has held for the past 13 years - and the National Federation of the Blind’s Environment Committee. She hopes her life story will help to inspire others who are losing their sight. The book will be available from Friday, July 16. A WOMAN who triumphed over adversity after going blind on her wedding day has relived her astonishing life in her autobiogaphy. Jill Allen-King was just a year old when she lost the sight in one eye after catching measles. Tragedy struck for the second time when she went completely blind from glaucoma on her wedding day, aged just 24. She hardly left the house for the next seven years. But, amazingly, she bounced back after the birth of her daughter and regained her independence after getting her first guide dog. 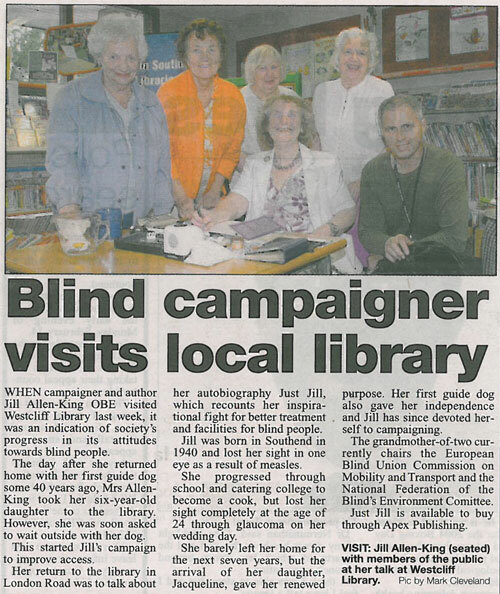 Mrs Allen-King, now aged 70, spent the rest of her life doing voluntary work and campaigning for blind and disabled people. Her tireless dedication was rewarded with an MBE, almost 30 years ago. Mrs Allen-King splits her time between her seafront bungalow, in Point Clear, and her home in Southend. She wrote much of her autobiography, called Just Jill, at her seaside retreat before finishing the book in Majorca. Mrs Allen-King said: “I love it down here. I really enjoy it. Mrs Allen-King, whose husband Alvin is also blind, started work on her autobiography in 1988 using a “talking typewriter”. She said: “I had to speak every word into the machine. Clacton-based publisher Chris Cowlin is publishing the book on July 16, Mrs Allen-King added: “Chris said he’d really like me to double it in size, so I spent hours and hours adding more bits in. 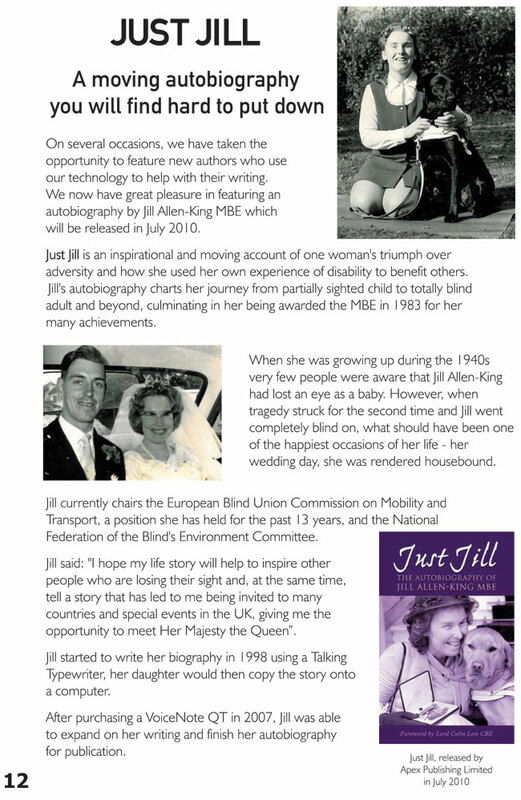 Jill Allen-King MBE currently chairs the European Blind Union Commission on Mobility and Transport - a role she has carried out for the past 13 years, and the National Federation of the Blind's Environment Committee. The reason for this is simple; Jill is blind herself. In this moving autobiography, Jill explains how she went blind in one eye when she was a toddler – as a result of contracting measles – and then lost the sight in her other eye as an adult. Many people would have sunk under the burden of such "bad luck", but not Jill. She rose to face an enormous challenge and set out determinedly to make sure that, for the rest of her life, she would fight to help others similarly afflicted. This book is truly an inspiration; well written and thoughtfully constructed. Don't miss it. There have been many books written by people who have lost their sight due to illness or accident, at birth or later stages of their life- to name but a few at random: Jacques Lusseyrand “And there was light”,Sir Ian Fraser “Whereas I was Blind and prof. John Hull “Touching the rock”. These and others concentrate on their authors’ achievements without dwelling on the every-day wherewithal of coping with the loss of sight. To lessen the impact on people faced with these problems, some claim in mitigation that blindness “is not so much a disability, rather an inconvenience”. It is, however, far too invasive into the normal lives of those afflicted to be thus downgraded. What makes this book so valuable is that, by pointing an accusing finger at the almost total lack of targeted social rehabilitation, it serves as a practical self-help guide to the adjustment to blindness, while simultaneously demonstrating what it takes to become a useful member of society, in other words, to integrate. But the book is more than just an autobiography or an encouragement to others in Jill’s position to do likewise. It succeeds to change public opinion about the impact of blindness in peoples’ lives, and it does so without deliberately setting out to do so, by the message it conveys. Let us be honest, peoples’ attitude to blindness, unless they are confronted by it directly or know someone in that position, is that they would find it quite impossible to live without sight. From ignorance rather than prejudice, this makes people think of the blind as inferior, whereas all they need is help to get from point A to pointB in unfamiliar surroundings. Modern technology helps them to meet most of their other needs. By constantly focusing on the difficulties she encountered at every stage of her life and how to overcome them, the author points the way ahead to all those in a similar position. Thus the book fulfils the equally necessary if not more important function of trying to change the received image the general public has of the blind as people unable to work, in receipt of incapacity and other benefits. In order to achieve independent mobility, blind people need a safe environment, and that is what Jill set herself to provide, with her brilliant films “get streetwise” and “give us back our pavements and with her tireless efforts of getting the builts environment adapted to the safety needs of visually impaired people. By the mid 1970s, Jill was a fully-fledged member of the Executive Council of the National Federation of the Blind. By means of an innate talent for public relations and public speaking, she had started to interest the written and spoken media in matters of concern to blind people. Her frequent appearances at public meetings, in print and in front of the microphone, locally and nationally, soon dubbed her with the accolade of “Mrs. Blind”. It was through her efforts that providers of public transport realised the need for spoken announcements of bus stops and train stations, structured crossings at major road junctions and pavements uncluttered by obstacles, including illegally parked motor vehicles. Jill was by now spreading her wings into other aspects of blind welfare and gaining a European and world-wide reputation, not merely in the fields of transport and the environment, but by highlighting the double handicap, in some societies, of being a blind woman. The Thatcher and Major Governments were sympathetic to her many suggestions; ministers such as Linda Chalker (transport) and Tony Newton (local government) provided the legislative platform for many of her proposals in the fields of transport and the built environment. She was also instrumental in getting the Public Utilities Street Works Act passed which, for the first time, provided stringent safety measures for pedestrians in the presence of road works. Provided the financial benefits for some of the tasks blind people were unable to perform for themselves. 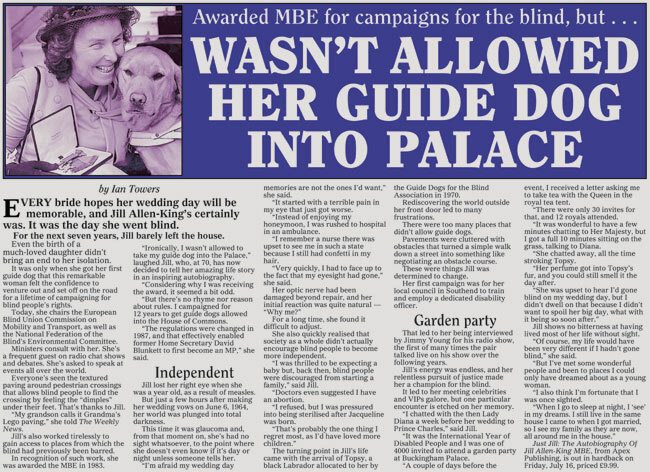 The award of the MBE in 1983 was merely a staging post, not an end to Jill’s activities on behalf of disabled people which have continued to the present day. All this and more is in the book, but there is also much “between the lines”: the responsibility to look after a family, the countless hours spent in writing letters, devising policies, travelling to conferences and speaking engagements at home and abroad without a thought of calling a halt. It is said that “those who are all things to all people risk being nothing to themselves”. 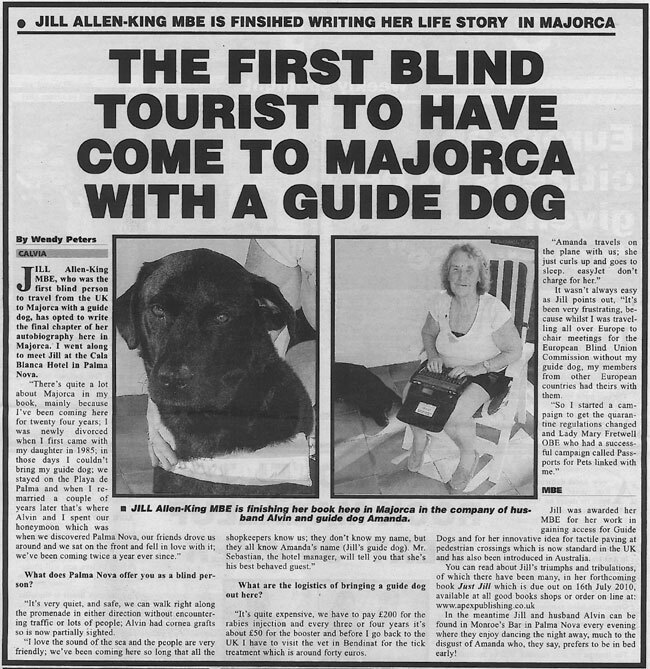 Jill avoided this trap by knowing when and how to relax in the company of her family and guide dog, in the sun on the beaches of Mallorca or outside her bungalow on the Essex coast. At the end, one is left with an overwhelming impression of someone who, by force of circumstances, was thrown into a role for which she was not originally intended – a challenge she met with admirable energy, endurance and strength of character. For anyone who is looking for ways of mending the “broken society” Britain has descended into according to our politicians, this book should be obligatory reading. If it needs a motto, it should surely be the roman one “Per Aspera Ad Astra” through darkness to the stars. 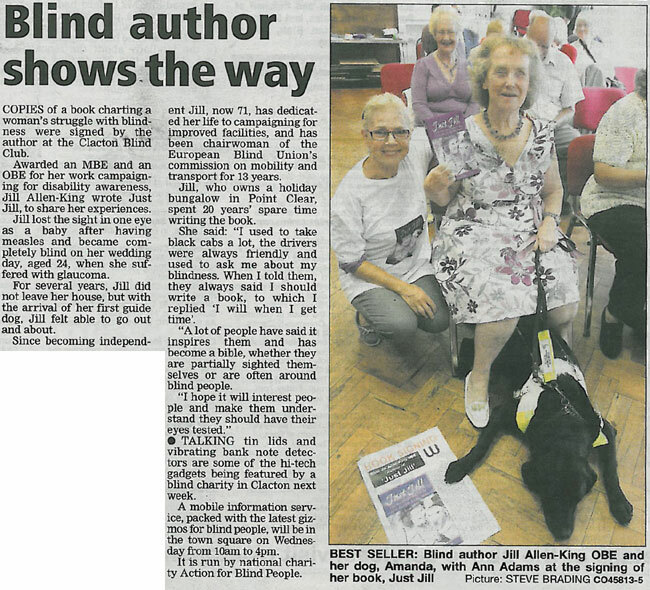 AN Eastbourne campaigner for the blind will be in town on Saturday (August 21) for the launch of her new autobiography. 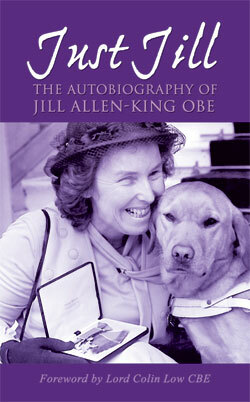 Jill Allen-King, MBE, will sign copies of Just Jill in Waterstones in Eastbourne from 2pm to 4pm. The 70-year-old grandmother's life changed overnight after she went blind at the age of 24 on her wedding day. 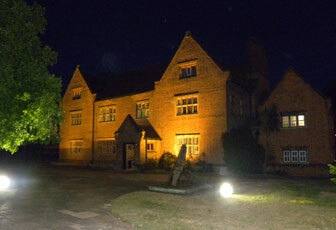 She spent her honeymoon in St Mary's Hospital in Eastbourne, marking the start of a struggle to regain her independence. 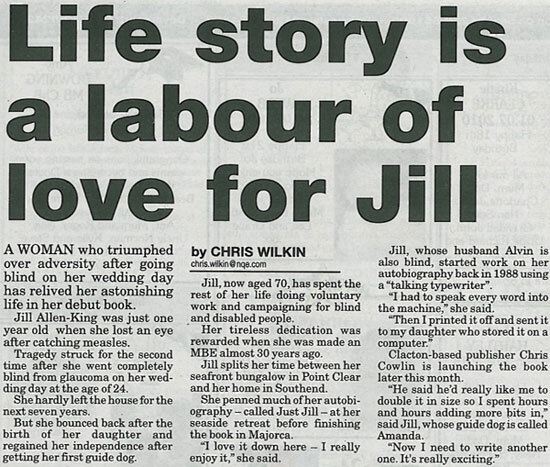 Her autobiography charts Jill's triumph over adversity, which culminated with her being awarded the MBE for improving the safety of pedestrian crossings for the blind. Jill was also due to appear as a guest on the Michael Ball TV show on Thursday (August 19) at 3pm. She hopes her story will help raise awareness about the health issues surrounding blindness. "One hundred people go blind every day in this country and 50 per cent could be cut if people went to have their eyes tested. The biggest cause is diabetes," she said. Jill believes her book will be an essential support for others in her situation. She said, "Lots of people wanted me to do it. I wanted it for my grandchildren. It was difficult to find the time to do it and I had to write it on a talking computer." 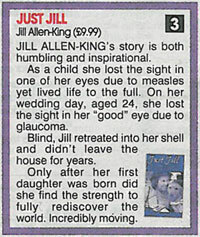 Jill lost the sight in one eye as a youngster after contracting measles. Tragedy struck again in her early twenties after she suffered a glaucoma which left her blind and virtually housebound. In 1971, things began to improve when Jill got her first guide dog and slowly began to regain he independence. She said, "First of all I had my daughter who gave me the will to live to bring her up. "I wanted to take her to school but I couldn't go out on my own because of all those obstacles on the pavement. Then I got my first guide dog who changed my life completely over the next 46 years." Jill will also attend a charity event on Friday at the Albany Lions Hotel, Eastbourne Seafront. 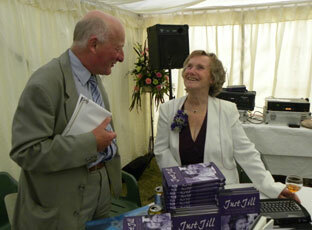 Just Jill is also available as an audio and brail copy from the RNIB. 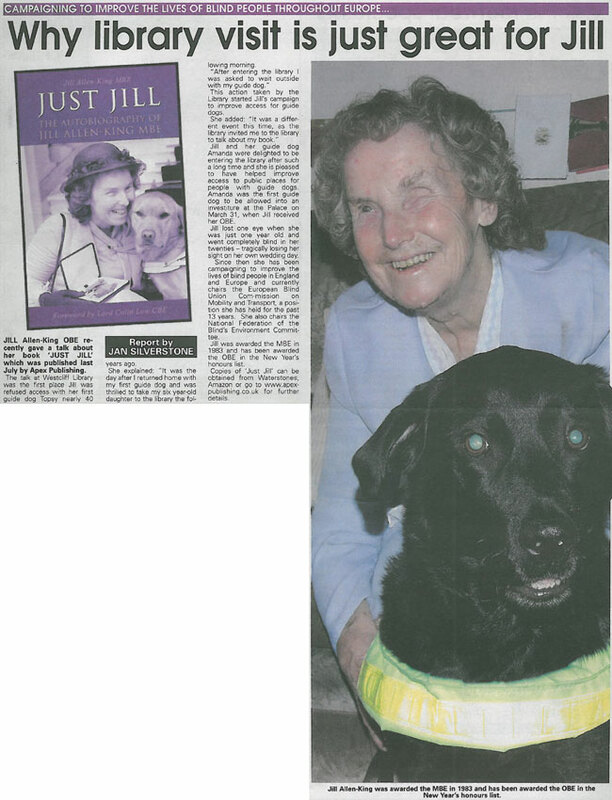 ‘Just Jill’ is a truthful, humble and inspiring biography describing Jill’s journey through sight loss and how her successful campaigning battles, on behalf of visually impaired and blind people, has improved the services available to them. Easy to read, I would recommend this book as an essential buy for all, with or without a visual impairment, because it isn’t about pity nor a new campaign, but it is rather about taking each one of us by the hand so that, step by step, we can understand the challenges of life with little or no sight. 1.8 million people in the UK are living with sight loss nowadays, but according to recent surveys, sight is the sense people fear losing the most, yet many of us don’t know the best way to look after our eyes. Like its title says, ‘Just Jill’ is simply the moving story of the everyday life of a truly inspiring woman whose achievements have improved the quality of life of thousands of others. 27 December 2009 - Jill Allen-King MBE was interviewed on BBC Radio Essex 103.5 & 95.3 FM. Jill answered questions about her book 'Just Jill'. 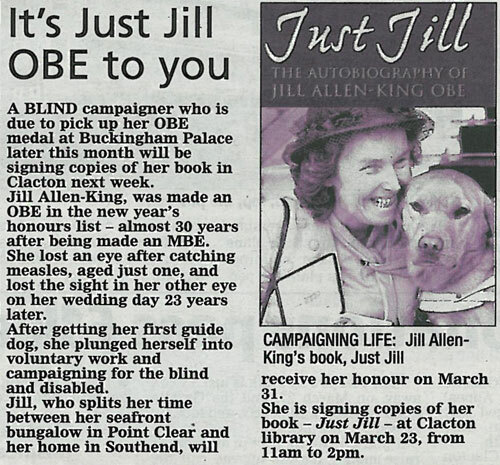 16 March 2010 - Jill Allen-King MBE was interviewed on BBC Radio Essex 103.5 & 95.3 FM. Jill answered questions about her book 'Just Jill'. 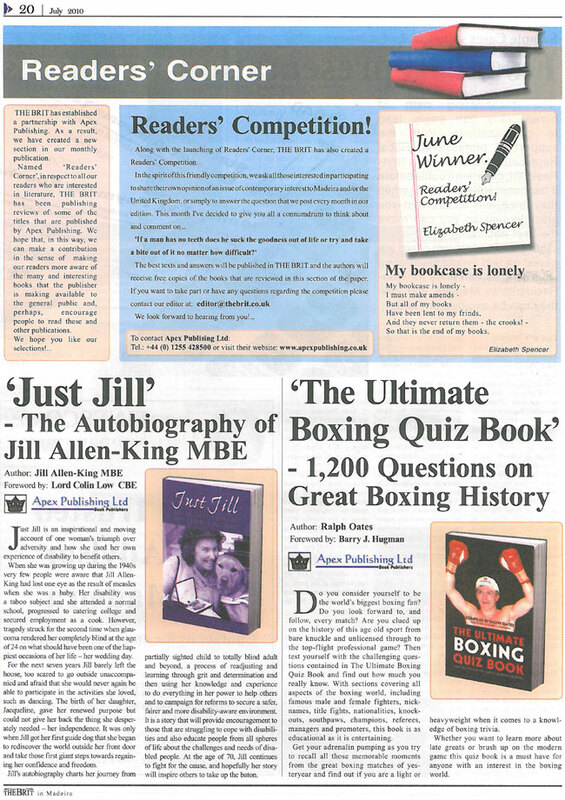 21 June 2010 - Wayland Radio 107.3 FM feature and review Jill Allen-King's book 'Just Jill'. 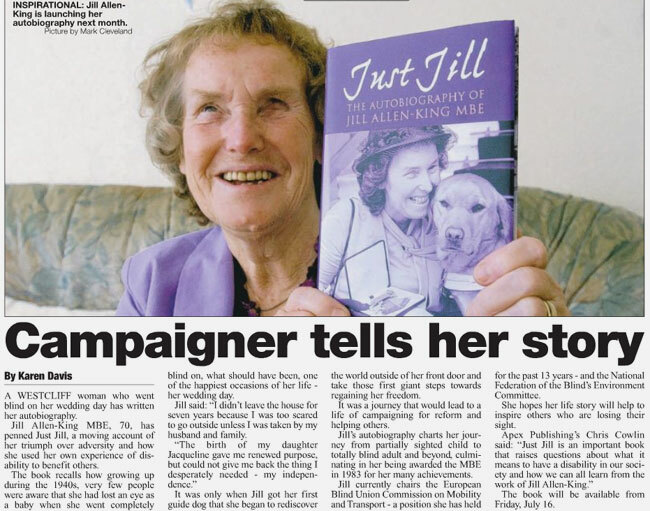 27 June 2010 - Jill Allen-King MBE was interviewed on BBC Radio Essex 103.5 & 95.3 FM. Jill answered questions about her book 'Just Jill'. 1 July 2010 - Jill Allen-King MBE was interviewed on Sine 102.6 FM. Jill answered questions about her book 'Just Jill'. 4 July 2010 - Jill Allen-King MBE was interviewed on BBC Radio Northampton 104.2 FM. Jill answered questions about her book 'Just Jill'. 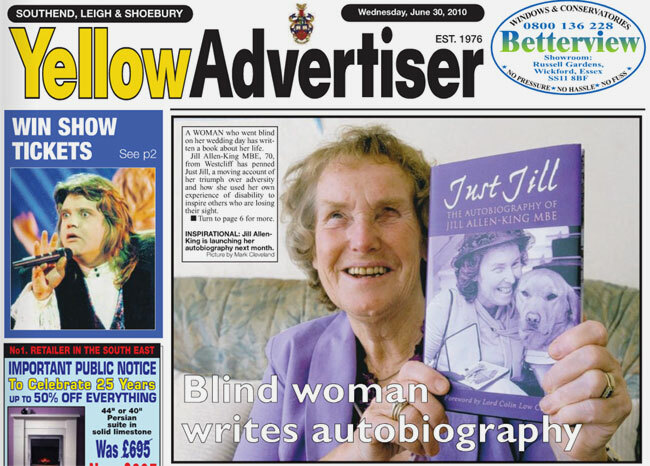 20 July 2010 - Jill Allen-King MBE was interviewed on BBC Radio Shropshire 96 FM. Jill answered questions about her book 'Just Jill'. 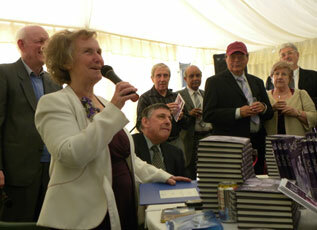 6 July 2010 - Jill Allen-King MBE was interviewed on C103 102.6 FM. Jill answered questions about her book 'Just Jill'. 19 July 2010 - An audio item about 'Just Jil'l has been included in this weeks edition of the 'Infosound Briefing'. The briefings are heard by blind and partially-sighted people across the UK, the briefings are mainly downloaded and used by local talking newspapers and radio stations in their own audio publications and programmes. 20 July 2010 - Jill Allen-King MBE was interviewed on Leith 98.8 FM. Jill answered questions about her book 'Just Jill'. 6 August 2010 - Jill Allen-King MBE was interviewed on BBC Radio York 103.7 FM. Jill answered questions about her book 'Just Jill'. 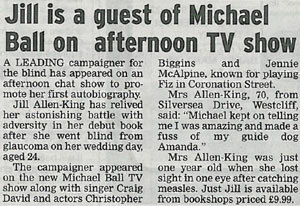 18 August 2010 - Jill Allen-King MBE was interviewed on The Michael Ball Show, ITV 1, about her book 'Just Jill'. Other guests on the show included Christopher Biggins, Craig David and Jennie McAlpine. 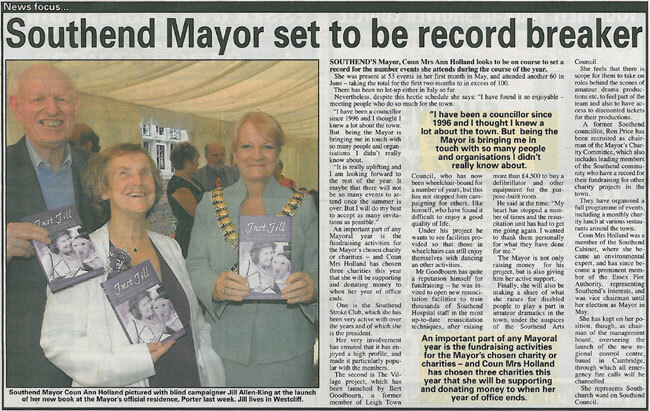 23 August 2010 - Jill Allen-King MBE was interviewed on BBC Radio Sussex and Surrey 95.3 FM. Jill answered questions about her book 'Just Jill'. 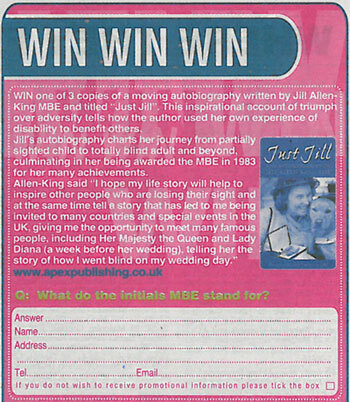 6 October 2010 - Jill Allen-King MBE was interviewed on Express 93.7 FM. Jill answered questions about her book 'Just Jill'. 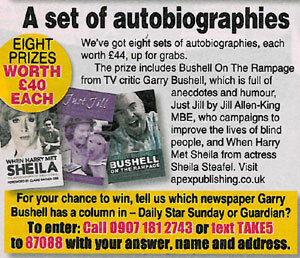 26 October 2010 - Jill Allen-King MBE was interviewed on BBC Radio 4. Jill answered questions about her book 'Just Jill'. 2 November 2010 - Jill Allen-King MBE was interviewed on BBC Radio 4. Jill answered questions about her book 'Just Jill'. 6 December 2010 - Jill Allen-King MBE was interviewed on France 5 (French National Television). Jill answered questions about her book 'Just Jill'. 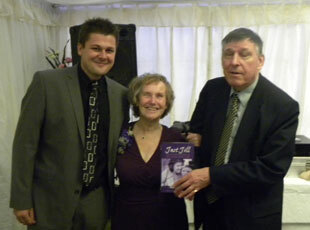 11 December 2010 - Jill Allen-King MBE was interviewed on Your Thurrock. Jill answered questions about her book 'Just Jill'. 14 December 2010 - Jill Allen-King MBE was interviewed on BBC Radio 5 Live 909 MW. Jill answered questions about her book 'Just Jill'. 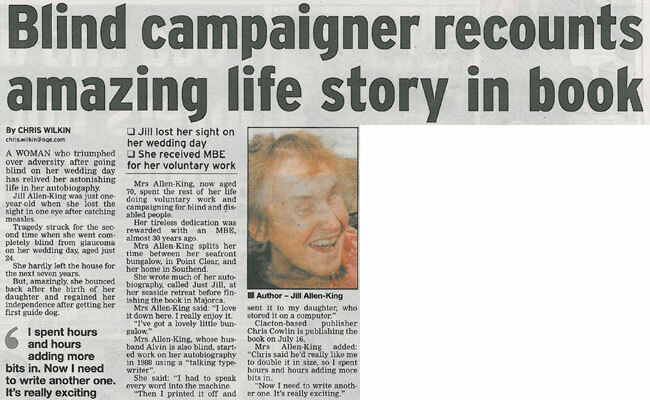 15 August 2011 - Jill Allen-King MBE was interviewed on BBC Radio 5 Live 909 MW. Jill answered questions about her book 'Just Jill'. 7 October 2011 - Jill Allen-King OBE was interviewed on BBC Radio 4. Jill answered questions about her book 'Just Jill'. 22 June 2016 - Jill Allen-King OBE was interviewed on Talk Radio Europe. Jill answered questions about her books 'Just Jill' and 'Jill's Leading Ladies'. Jill was interviewed on the drive time show, 'The Daily with Sid Olivera'. I read Jill’s book and I loved it! It kept me engaged from the first page, made me cry, smile, angry, happy and I am amazed to see how strong Jill has been all her life. Jill should be very proud of her work and personally I admire all her courage and strengths. 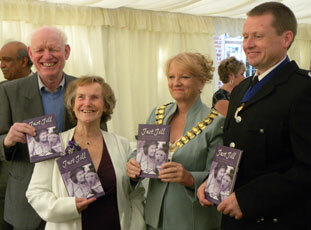 Jill Allen King MBE launched her book 'Just Jill' at The Mayor’s Official Residence, Southend on Sea. 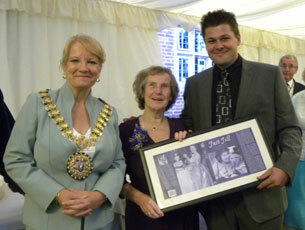 Guests included Councillor Ann Holland, Mayor of Southend, Lord Colin Low CBE, and Southend MP David Amis. Jill Allen-King MBE signed copies of her book 'Just Jill' at Waterstone's, Lakeside Shopping Centre, Thurrock. 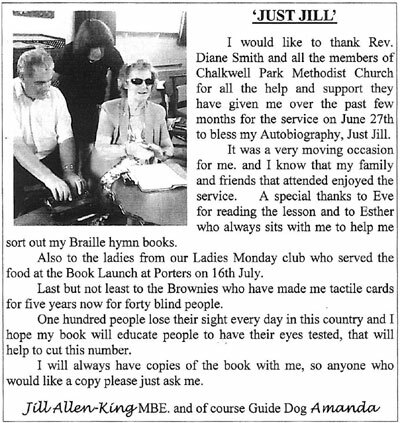 Jill Allen-King MBE talked about and signed copies of her book 'Just Jill' at Chalkwell Park Methodist Church, Westcliff. Jill Allen-King MBE signed copies of her book 'Just Jill' at Waterstone's, York. 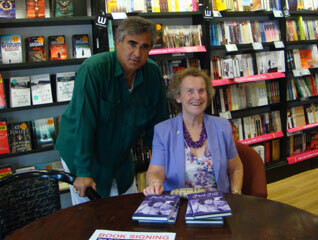 Jill Allen-King MBE signed copies of her book 'Just Jill' at Waterstone’s Scarborough. Jill Allen-King MBE signed copies of her book 'Just Jill' at Waterstone's, Southend. Jill Allen-King MBE signed copies of her book 'Just Jill' at Waterstone's, Eastbourne. 15 September 2010 - Jill Allen-King MBE signed copies of her book 'Just Jill' at Waterstone's, Bury St Edmunds. 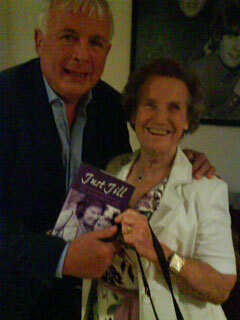 18 September 2010 - Jill Allen-King MBE signed copies of her book 'Just Jill' at Waterstone's, Liverpool One. 8 October 2010 - Jill Allen-King MBE signed copies of her book 'Just Jill' at Waterstone's, Above Bar, Southampton. 11 December 2010 - Jill Allen-King MBE signed copies of her book 'Just Jill' at Waterstone’s, Lakeside Shopping Centre, Thurrock. 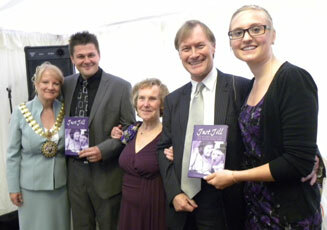 23 March 2011 - Jill Allen-King OBE signed copies of her book 'Just Jill' at Clacton Library, Clacton on Sea. 2 April 2011 - Jill Allen-King OBE signed copies of her book 'Just Jill' at Waterstone's, Lakeside Shopping Centre, Thurrock. 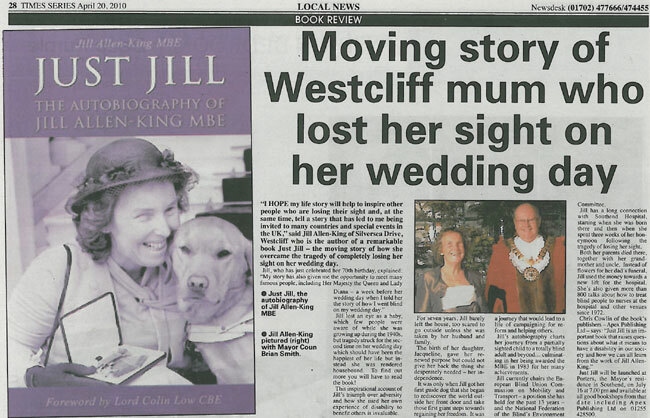 8 June 2011 - Jill Allen-King OBE signed copies of her book 'Just Jill' at Westcliff Library, Westcliff-on-Sea. 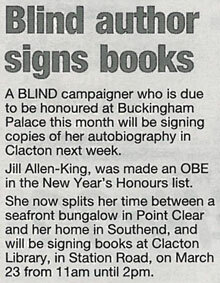 9 June 2011 - Jill Allen-King OBE signed copies and talked about her book 'Just Jill' at Clacton Blind Club, Rosemary Road, Clacton on Sea. 21 June 2011 - Jill Allen-King OBE signed copies of her book 'Just Jill' at Southend Christian Bookshop, Southend. 10 December 2011 - Jill Allen-King OBE signed copies of her book 'Just Jill' at Waterstone's, Lakeside Shopping Centre, Thurrock. 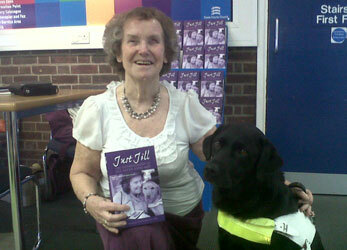 18 March 2017 - Jill Allen-King OBE talked about and signed copies of her books 'Just Jill' and 'Jill's Leading Ladies' at the Essex Book Festival, Chelmsford Library, Essex.